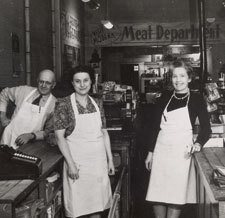 Hy-Vee was founded in the 1930's, and the rest is history. With a goal to provide “good merchandise, appreciative service and low prices,” Charles Hyde (1883-1970) and David Vredenburg (1884-1949) opened a small store in Beaconsfield, Iowa, in 1930. The store was leased only a few weeks before the stock market crash of October, 1929. The two men began calling their operation Hyde & Vredenburg in 1933. 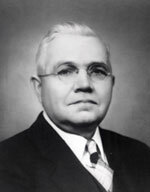 On January 1, 1938 the partners and 14 others incorporated 15 Iowa and Missouri stores as Hyde & Vredenburg, Inc. Dwight Vredenburg (1914-2002), the 23-year-old son of David Vredenburg, was elected the company’s first president. In addition to the stores, the company operated an office, warehouse, mill and meat plant, all located in Lamoni, Iowa; a bakery was opened later that year. Gross sales in 1938 totaled over $1 million. Since its founding, Hy-Vee stores have operated autonomously, choosing their own inventories and setting their own prices. Store managers (now referred to as store directors) were then, and still are today, encouraged to test new ideas. One of the first such entrepreneurial concepts – employee bonuses – was introduced in 1936 and endures to this day. The Hyde & Vredenburg Supply/Service Stores offices in Lamoni, Iowa, where the company was headquartered from 1930 to 1945. Beginning in the 1930s, store managers met in the backroom of the Unionville, Missouri, store to discuss operations and plan advertising jointly, with each store manager free to alter this ad. It is a tradition that continues today with regular store director and executive staff meetings at the corporate office in West Des Moines, Iowa, to hear educational presentations, share news and vote on corporate policies. 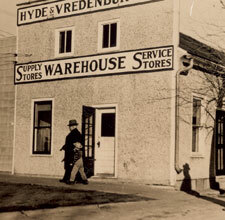 In 1933, Hyde and Vredenburg decided to pay its store managers on a profit-sharing basis. At the start of the decade, a new type of store was opened at Centerville, Iowa, where company president Dwight Vredenburg also served as store manager. This store offered customers the newly invented shopping cart, self-service and a frozen food case. At the end of the decade, again in Centerville, Hy-Vee opened its first supermarket outside of town. It was the first store in a brand new building and with its own parking lot. To celebrate this event, the store held a grand opening, a tradition that continues today with each new Hy-Vee store opening. 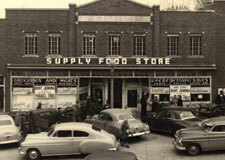 The Corydon, Iowa, Supply Store in 1946. In 1941 Hyde & Vredenburg had sales of $2 million. That same year the company made its first corporate donation, to the Boy Scouts of Lamoni, a philanthropic practice which has grown significantly over the years. Giving back to the communities in which Hy-Vee operates is one of the important principles of the company. The Bethany, Missouri, Supply Store in the 1940s. At the end of World War II in 1945, the Chariton Wholesale Grocery was purchased and the corporate offices moved to Chariton, Iowa, the company closing its Lamoni subsidiaries over the years from 1944 to 1948. By 1948 Hyde & Vredenburg, Inc. had a transportation division of 22 tractor-trailer trucks. That year, the new warehouse facility in Chariton, now called the Chariton Distribution Center, opened. Co-founders Charles Hyde and David Vredenburg retired in 1949; David Vredenburg died later that year. At the end of 1949, there were 29 stores. In 1952 a contest was held to rename the stores which were operating under the names of “Supply Store” or “Service Store,” preceded by the name of the town. The winning name, Hy-Vee, was formed from a contraction of the co-founders' names Hyde and Vredenburg. Creston, Iowa, store manager Harry Byars changes the store's sign to the new Hy-Vee name in 1952/1953. The data processing department (now called the information technology department) opened in 1954, which marked the beginning of the increasing importance of new technology. Private label products using the name Hy-Vee name and Regal trading stamps were introduced in 1956. Regal stamps were offered to customers for 28 years until being discontinued in 1984. 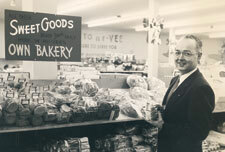 Company president Dwight Vredenburg at the first in-store bakery (Iowa City #1 on Kirkwood Avenue) in 1957. In 1957 the first in-store bakery opened, the first of many in-store departments to serve customer needs and provide a one-stop shopping experience. At the end of 1959, there were 37 stores and approximately 1,200 employees. The first store in a metropolitan area, in Johnston, Iowa, a suburb of Des Moines, opened in 1959. The Employees' Trust Fund was established in 1960, enabling all eligible employees to share in the ownership of the company. It was the beginning of the company's long and proud tradition of being known as an employee-owned business. The first Drug Town opened in Cedar Rapids, Iowa, at 24 Wilson Avenue in 1969. The Drug Town stores, located in Iowa and Nebraska, were named Hy-Vee Drugstores in 2005. Springtime Party, still an annual tradition combining spring cleaning with a celebration complete with store decoration themes and costumed employees, was introduced in 1960, while the decade also saw the introduction of the slogan “A Helpful Smile in Every Aisle” (1963) and the service award dinners, to honor employee work longevity (1964). New store developments in the 1960s included the first courtesy counter (1960), the first eat-in area and the first express lane checkout (1961) and the first delicatessen operation (1967). Hy-Vee began advertising on television in 1961, the same year the company bought its first computer system. In 1963 stockholders approved a corporate name change to Hy-Vee Food Stores Inc. and Hy-Vee introduced its second logo, a stylized shopping cart. The same year, the Hy-Vee Employees' Trust Fund acquired National Bank & Trust of Chariton, Iowa, whose ownership passed from the Trust to the corporation itself in 1986. The first multi-store purchase from another store operator occurred in the Cedar Rapids area in 1966, adding four stores. In 1969 Hy-Vee added a drugstore operation when it opened its first Drug Town. Also in 1969, the company expanded to its third state, Minnesota, when it merged with Swanson's Stores Inc., based in Cherokee, Iowa. The Hy-Vee Foundation began funding college scholarships in 1969. At the end of the decade, there were 66 stores. A number of store milestones were reached in the 1970s. The company opened its 100th store at Keokuk, Iowa. It also entered three new states: South Dakota in 1975 with a store in Brookings; Nebraska in 1977 with a store in Norfolk; and Illinois in 1979 with a store in Macomb. 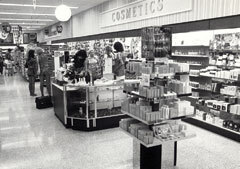 The cosmetics counter at the West Des Moines, Iowa, Drug Town, in the 1970s. Stores introduced electronic cash registers in 1975 at Keokuk and in-store floral shops in 1979. The Regal Distribution Center in Chariton, Iowa, was built in 1973 and a new distribution center was constructed in 1976 in Cherokee, Iowa. Dwight Vredenburg was elected the first chief executive officer and chairman of the board in 1978. 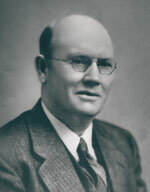 Cofounder Charles Hyde died in 1970. At the end of 1979, there were 124 stores and approximately 10,000 employees. 1982 was the first billion dollar sales year for Hy-Vee. In 1983 the 150th store opened in Lincoln, Nebraska. Perishable Distributors of Iowa Inc. was created in 1982 to provide fresh meat, fish and seafood products. The same year, Hy-Vee entered the Lincoln and Omaha markets with a group purchase of stores. Hy-Vee began operations in its seventh state, Kansas, in 1988 with the opening of a store in Overland Park. The first combination food and drug store – referred to in the industry as a combo store - opened in 1985 at Lincoln, Nebraska on Old Cheney Road. An experiment with warehouse-type stores began in 1980 with the Save-U-More stores; the format was discontinued in 2001. Electronic scanners were introduced in 1980 when the Dubuque, Iowa, Save-U-More store opened. The Des Moines, Iowa, Number 1 store, which opened in 1986 in a new building at Harding Road. Expanding services to customers included video rentals (1984), bank branches in stores (1984) and pizza (1989). The first company-wide ad appeared in 1981. In 1984 Hy-Vee made national news when it became the second store in the nation to offer customers the use of a debit card to pay for their purchases. The second private-label, an economical line of products, first called Lots of Value and later renamed Midwest Country Fare in 1998, debuted in 1987. From 1989 to 1999, Hy-Vee operated a chain of convenience stores called Heartland Pantry. In 1983, the company, which had been in business for 45 years, elected only its second president, Ron Pearson. In 1989, when his predecessor Dwight Vredenburg retired, Pearson was elected chief executive officer and chairman of the board. Also in 1989, the company's first history book, The Family of Hy-Vee, was published and the first free-standing floral department opened. At the end of 1989, there were 173 stores and approximately 23,000 employees. 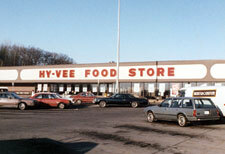 It was in the 1990s that Hy-Vee diversified its operations through the development or purchase of several subsidiaries. Lomar Distributing, Inc. became a part of Hy-Vee in 1990 to provide specialty and gourmet imported items to both Hy-Vee stores and other businesses. The Norfolk, Nebraska Number 2 (Taylor Avenue) Hy-Vee Gas operation. The first Hy-Vee Gas opened at Davenport, Iowa, in 1997. In 1991 Perishable Distributors of Iowa (PDI) acquired Sunrise Dairy, which supplied dairy products and ice cream to stores. In February 1992, D&D Foods of Omaha, Nebraska, was acquired as a supplier of fresh salads and dips to Hy-Vee stores and now includes meat products such as Hy-Vee's popular chicken grillers in its product line. Also in 1992, Florist Distributing Inc. was acquired to provide fresh flowers, plants and decorative items. The Meyocks Group advertising agency was acquired in 1994 to handle advertising, public relations and related services for Hy-Vee and outside clients; it was sold in 2008. Hy-Vee Weitz Construction, L.C. was formed in 1995 to serve as general contractor for Hy-Vee Inc. In 1995 National Bank & Trust Company changed its name to Midwest Heritage Bank; the following year, the bank began operating branches in several Hy-Vee stores. Hy-Vee Bakery Manufacturing was established in 1996. The Chariton Distribution Center opened its ice-making facility in 1990. In 1991 Hy-Vee became the largest private employer in the state of Iowa, a distinction still held today. The third corporate logo, the white Hy-Vee name on a red background, appeared in 1993. Hy-Vee's CEO, president and chairman of the board Ron Pearson welcomed President Bill Clinton, Iowa Governor Terry Branstad, U.S. Senator Tom Harkin and American Red Cross officials to the Des Moines, Iowa, Number 5 (Army Post Road) store in 1993, as Hy-Vee distributed water, food and supplies to flood victims. 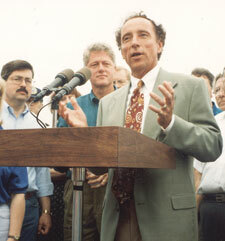 In 1993 during heavy flooding in Iowa, Hy-Vee welcomed President Bill Clinton to the bottled water distribution site at the Des Moines, Iowa, Number 5 store. In 1995 Hy-Vee Food Stores Inc. changed its name to Hy-Vee, Inc. That same year the corporate offices were relocated to West Des Moines, Iowa. The office also houses the Hy-Vee Conference Center. In 1998 the corporation reached $3 billion in sales and the Employees' Trust Fund was reorganized into the Employees' Profit-Sharing Trust Fund and 401(k) Plan. The Drug Town chain expanded into Nebraska in 1998. Film processing was introduced to the stores in 1990; the first Chinese Express department opened at the Independence, Missouri, store (on East 23rd Street) in 1992; and Hy-Vee Kitchen in 1996. The first Hy-Vee Gas operation opened in 1997 at Davenport, Iowa. A third private-label line of products called Grand Selections was introduced in 1999. Customers were able to contact the company about products using a toll-free product phone line introduced in 1993. The Hy-Vee Web site debuted in 1996. Customers were introduced to online grocery shopping in 1998. The Road of Gold program, which rewards Hy-Vee truck drivers with accident-free records, was introduced in 1995. Consumer Reports ranked Hy-Vee the fifth-best supermarket chain in the nation (1997) in the magazine's first such survey. By the end of 1999 there were 208 stores and 43,000 employees. At the turn of the century, Hy-Vee increased its focus on customers' healthy lifestyles. HealthMarket private-label products were introduced in 2001. The company also began its initiative to provide customers with the services of corporate and in-store dietitians. It is an initiative for which Hy-Vee has been highly praised throughout the industry. In 2000, the company enjoyed the national spotlight when media revealed that Kurt Warner, NFL quarterback for the Super Bowl-bound St. Louis Rams football team and its ultimate victor, had worked as a night stocker for Hy-Vee at its Cedar Falls, Iowa, store, a story repeated when Kurt again played in the 2002 Super Bowl as quarterback for the St. Louis Rams and the 2009 Super Bowl as quarterback for the Arizona Cardinals. The fourth Hy-Vee logo, red letters on a white background, was unveiled in 2004. The company opened a number of Hy-Vee Gas stations in the 1990s. It was also a decade in which the company increased prescription services to customers with the acquisition of pharmacies and the opening of more pharmacy departments in the stores. Stores began offering an expanded line of ethnic foods to the increasingly diverse population of the Midwest. Online shopping capabilities expanded in 2005, with a redesigned Hy-Vee Web site offering online shopping for such items as holiday meals, floral arrangements, catering selections; gift cards were added in 2006. In 2005, employees were linked through a new intranet called Hy-VeeNet. In 2000 the profit-sharing plan was renamed the Hy-Vee and Affiliates Profit Sharing and 401(k) Plan. The company redesigned its store interiors in the 1990s and expanded into baby, pets and additional general merchandise departments. In 2008, a newly relocated Des Moines store on Fleur Drive became the company's largest, with more than 91,000 square feet, to be surpassed in 2011 as the largest store. At the other end of the shopping spectrum, the company introduced a new, smaller store format with the opening of its first Heartland Pantry in Lincoln, Nebraska, using the name of Hy-Vee's former convenience store chain. The store focuses on the basics: packaged and canned goods (much of it private-label), fresh produce, dairy, meat and some natural and organic offerings. The store's name was changed to Hy-Vee Mainstreet in 2011. Drug Town stores were renamed Hy-Vee Drugstores in 2005. Opening in 2004 was Hy-Vee Hall, the convention/event center part of the Iowa Events Center in downtown Des Moines, for which Hy-Vee had purchased the naming rights. New technology increased distribution center, office and store services, with advancements in computer capabilities, such as new servers and radio frequency selection, in the distribution centers providing new efficiencies. Hy-Vee was selected as Progressive Grocer's Retailer of the Year in 2003. Hy-Vee celebrated its 75th anniversary in 2005 with the publication of a second company history book (The History of Hy-Vee) and the fourth employee cookbook, the introduction of the Smiles for Education program to benefit schools and students, a $75,000 kitchen makeover contest and the introduction of the popular, free Seasons magazine, which offers tips, recipes and specially priced items to customers. In 2007, Hy-Vee's first store, which was located in Beaconsfield, Iowa, was placed on the National Register of Historic Places. Beginning in 2007, Hy-Vee has sponsored the richest purse in triathlon history with the Hy-Vee World Cup Triathlon, held in summer in the Des Moines area. The 2008 event was the final qualifying triathlon for the Beijing Olympics that year. Community involvement programs saw record funds raised in support of the Juvenile Diabetes Research Foundation (JDRF) and Variety The Children's Charity. Some of those funds were raised through sponsorship of such events as the Hy-Vee Classic Senior Women's Golf Tournament (2000-2006) and its successor event, the Hy-Vee World Cup Triathlon, introduced in 2007. Hy-Vee, its employees stores continued to receive several awards during the decade for its philanthropic and industry achievements, from JDRF, Variety and other groups. In 2001 Ron Pearson was elected to serve for two years as chair of the Food Marketing Institute, the authoritative voice of the industry. That same year, Ric Jurgens was elected president of Hy-Vee; he was elected chief executive officer in 2003 and to chairman of the board in 2006. Ron Pearson currently serves the company as chairman emeritus. In fiscal year 2009, Hy-Vee had sales of exceeding $6.3 billion; it is the second-largest employee-owned company in the United States and is ranked by Forbes magazine as the 48th-largest privately owned company in the country. There are currently over 55,000 employees working in the Hy-Vee family. At the end of 2009, there were 228 stores. In 2009, Hy-Vee moved into its eighth state of operations when the store in Madison, Wisconsin, opened. Hy-Vee's fourth president, Randy Edeker, was selected to lead the company in December, 2009. Ric Jurgens retains the titles of chairman and chief executive officer. This decade marked a great deal of expansion for Hy-Vee as we entered 11 new cities and added new locations in cities with existing stores. 2015 marked a significant milestone as the company entered the Twin Cities market with the opening of stores in New Hope and Oakdale, Minnesota. Highlighting Hy-Vee's long-term commitment to the Twin Cities market, we became a founding partner of U.S. Bank Stadium and an official partner and exclusive grocer of the Minnesota Vikings football team and Minnesota Wild hockey team. In May 2012, with the retirement of CEO and chairman of the board, Ric Jurgens, president Randy Edeker was elected CEO and chairman — the fourth person in Hy-Vee history to hold these titles. Hy-Vee increased communication with its customers through social networks, including Facebook, Twitter, Instagram and Vine, and a mobile-optimized site. A new employee intranet, named Connect, succeeded the former Hy-VeeNet. The Fuel Saver program, introduced in 2012, offered customers the ability to save on gasoline purchases at Hy-Vee with the purchase of select items or services in the stores; however, the program got an upgrade in July 2015 with the launch of Fuel Saver + Perks™ which allows customers to continue earning discounts on gasoline while also providing them exclusive deals, rewards and incentives. Hy-Vee continued its focus on health and wellness with the addition of more in-store dietitians, HealthMarket® departments and the introduction of the Hy-Vee Healthy You Mobile in 2013. In 2015, Hy-Vee also initiated a major effort to increase the number of retail health clinics in its stores. In 2013, a central-fill pharmacy, the Pharmacy Fulfillment Center, opened in Des Moines. Hy-Vee purchased The Weitz Company interest in Hy-Vee Weitz Construction in February 2013. The company changed its name to Hy-Vee Construction, L.C. Along with the addition of in-store chefs, two new dining concepts — the Hy-Vee Market Grille and the Hy-Vee Market Café — were introduced, offering customers a sit-down dining experience with wait staff, alcoholic beverages and outdoor patio seating in many cases. New store introductions included artisan breads, made-to-order sushi and salads, Angus Reserve beef, air-chilled COOL chicken, specialty cheeses, charcuterie and several bakery items. 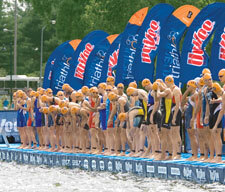 The Hy-Vee IronKids Midwest Triathlon series debuted in 2011, as did the first 5150 Series triathlon at the annual Hy-Vee World Cup Triathlon event, which occurred every year until 2014. In March 2015, Hy-Vee announced a partnership with the Pinky Swear Foundation and that following summer, Hy-Vee Pinky Swear Kids Triathlons were held in four states. The money raised provides financial support and unique programming to children battling cancer. In February 2014, Hy-Vee announced the acquisition of specialty pharmacy solutions provider, Amber Pharmacy, based in Omaha, Nebraska. Hy-Vee's seafood sustainability program, Responsible Choice, was nationally recognized when Hy-Vee was ranked in the top five out of the 25 largest supermarket chains in the United States by Greenpeace in 2014. The following year, Hy-Vee moved up in the rankings to third. A fun, at-home online exercise program for kids and families, Hy-Vee KidsFit™, was launched in 2015. The easy-to-follow workout videos, with a personal trainer, was designed to ensure all families have access to healthy activities. Hy-Vee Aisles Online® was fully implemented in October 2015 and allows customers convenient online grocery shopping through the company's website with pick up or delivery options. In 2015, Hy-Vee celebrated its 85th Anniversary. To thank customers for 85 wonderful years, Hy-Vee brought back the popular “Brands for Grands” promotion, which gave customers the chance to win $8,500 when they purchased Hy-Vee brand products. As of year-end 2015, Hy-Vee operates grocery stores/drugstores in eight states — Illinois, Iowa, Kansas, Minnesota, Missouri, Nebraska, South Dakota and Wisconsin. The largest store is located in Bloomington, Illinois, with more than 108,000 square feet.